(CNN) -- Grappling with its worst economic crisis since World War II, Japan posted a record $10.1 billion trade deficit in January, the Ministry of Finance reported Wednesday. Japan's exports have seen the largest rate of decline since the ministry began issuing the figures in 1980. It was the fourth straight month of deficits as exports of vehicles, auto parts, electronics and semiconductors slumped. The negative run is the worst since a 14-month period from July 1979 to August 1980. Exports were down nearly 46 percent from January 2008 levels to $36.8 billion -- the largest rate of decline since the ministry began issuing the figures in 1980. 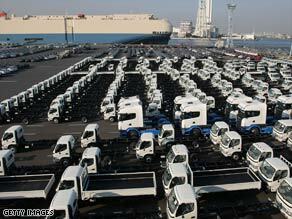 Japan's demand for imports also declined, dropping 31 percent. While Japan retained its trade surplus with the United States, it slipped 75 percent in January. It was the sharpest decline in 23 years and the 17th straight month that the surplus had fallen. Japan ran a trade deficit with China for a fifth consecutive month. January's deficit totaled $6 billion, pushing Japan's balance of trade with all of Asia into negative territory for the first time in three years, at $4.6 billion. Earlier this month, Economic and Fiscal Policy Minister Kaoru Yosano called the recession the worst economic crisis in the post-war era. His comments came following the release of fourth-quarter gross domestic product figures that showed a 12.7 percent drop in economic output.